that away, men are but gilded loam or painted clay." Materiały, co do których nie jestem w stanie ustalić ich pierwotnego źródła - kiedyś na nie trafiłem i zalegały na dysku. Materials to which I am unable to tell their original source, and since I’ve spotted them, they were stored on my hard drive. “World Debit MasterCard cardholders are eligible for discounts on a variety of products and services, and have access to enhanced customer service and security features. The KeyBank World Debit MasterCard will also feature MasterCard PayPass contactless payment functionality. This offers cardholders increased speed and convenience at the point of sale by allowing them to “Tap & Go”"
Interesting remarks on the cheques convenience. I’ll never get them right, why do people bother with them, but it is only because in Poland we’ve skipped this chapter of financial services. As almost everything after the communism fall had to be built from scratch, CEE banking systems are rather modern, and from start were created to use top solutions of their time. So we’re using payment cards, or e-banking in a greater manner. What I do miss, and frankly do not understand is the fact of small popularity of the gift cards. Oh, well maybe no one tried really hard to sell them. “Matt Lanford, Head of Prepaid Europe at MasterCard, commented: “More companies are turning to prepaid cards as a safe and convenient alternative to inefficient and costly paper-based payments. Independent research from PSE Consulting suggests that this trend will continue in Europe, with payroll cards estimated to turn over €10.7 billion by 2015.”"
Idea of convenience is obviously good (you will never forgot or lost such ‘card’ right? ), but not in a such implementation. Fingerprinting disregarding privacy issues is equalized with the crime world. It is never a good idea to make your Clients feel like common criminals. There’s a lot of photos and a video how this nice thing works under the above link. Very good idea on an interaction with current and potential Clients, literally any pedestrian. Unique ideas like that always attract attention of the general public. It reminds me described on this website bus-stop-scale (and similar solutions, not yet described ;-)). Banks do love that word, some good examples of slogans are there. I do like the ‘I love fees’ (supported by a website) series, like an old man saying: ‘Finding all those fees in my bank statements keeps my mind active., and at my age that’s important’. Videos are placed in the article, ‘Free research’ series is also good. What times do we live in. People voluntarily are getting rid of their privacy, and all to the glory of the financial institution… Disregarding morals, ethics, and credulousness his is a good concept. Institution is there to help you, and you will feel better in a community of people with similar worries. That’s what the social buzz is all about right now (and will be in predictable future). I do not want to copy all of it here, so I do really recommend visiting the link. 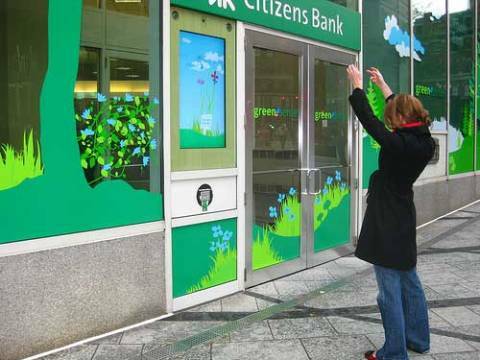 Creating a distinct brand identity should be the ultimate goal of all financial institutions. Services, procedures, rates etc. that all can be copied, but our IDENTITY defines who we are. This is the one thing that ca not be copied – not only because strict copyright/intellectual property laws, but because of people who create it. Description of the Barclays campaign, to which I made some remarks here. I must getting old, as the Twitter hype really bypasses me, but I do see its potential. Also, it s rather serious business, as some might pay for it 700 000 000 $… It reminds me the $15 billion Facebook evaluation some time ago, but never mind that. If something is free to use, and give an opportunity to contact with your Clients, it would be a shame not to use it. But in the other hand, being too much wide open for communication is not a good idea in times of crisis. ABA Banking Journal deals with some issues here. I like the idea of card stamped during every deposit. Kids love to collect such stuff, maybe they should’ve evolve the concept into more-like Pokemon style ;-). That’s a joke, but if you’re planning to deal with kids, it is always good to have a fluffy animal mascot around. It is always a good idea to give people an opportunity to compare themselves with other people anonymously. It is said, that people want to be special. I disagree, in terms of financial issues they do want to follow the crowd, they want to be average, as thanks to that they feel safe. This tool gives them an opportunity to do so. It’s been a part of a branch of the future concept for a long time, the only concern is how it and similar solutions will inflict into Clients privacy. What is their acceptance level? Client is not interested in a benefit for the bank, he always asks what are the benefits for him, so unless such privacy invading solutions will be properly supported by improvements in convenience/quality of services, I see a misty future for them. Going Green to the Extreme! The last one is especially interesting. It’s not important whether that initiative was their own, or they were strongly suggested to do so, the image counts – our employees care. Anchorage: Consumers of all ages are looking for balance and security. This is in the same vein as the “nesting” that was so popular after 9/11. Here, however, Getty sees popular searches like “balance,” leading to images of yoga, spas and balancing rocks. “Fun,” the most popular search word five years ago, has given way to “dream,” still aspirational, but slightly more serious. Guru Joe: Corporate execs are out; relatable experts are in. Getty sees a move toward personas and faces that are believable, empathetic and “quietly aspirational.” A parallel trend is in raw visuals—essentially well-framed snapshots that connote a company’s authenticity. It’s always hard to get to the young people. Interesting point, with greater highlight putted on ‘dream’ than fun. More mature? Hardly, maybe more realistic. I do agree that financial institutions should use more of the so-called ‘independent’ experts and professionals to gain credibility. Is Saving a Game of Chance? Nope. Banks are well familiar with promoting their products with a lottery system. It’s impossible to say in definitive matters whether it is good or bad solution. When properly designed, it can become beneficial, but it can be as well a waste of money. I’m a supporter of the solution based on fewer prizes, but of the greater value. Clients will not decide to choose us, only because we’ll give them a calendar, bag or an umbrella when making i.e. a deposit. What really matters is the opportunity to win the BIG prize. I must agree that in terms of communication as stated above, Clients often don’t perceive interest as they should. That’s why a strategy of showing examples exists, like we’ll rather promote a deposit with yearly interest of 5% by i.e. ‘on every 10 000 deposited in our institution, you’ll earn 500’. There are ways to sell it in a more attractive way. I’ve also been once excited with the whole Second Life in finance industry deal, but examples which I’ve seen were having a rather minor success. Still, the virtual reality is a platform of communication with a great potential, but for now I believe it will evolve into interaction on the level of social networking websites. Quite a lot of interesting points out there, mostly ok. The idea of targeting parents in the youth initiatives is a real eye opener. It’s true, that in most cases, especially when we are not interest in the subject, are not researching by ourselves, we go for an advice to our close ones. Young people are financially dependant on their parents, so their opinion is crucial. That’s why the ‘family’ accounts should have a significant place in the bank offer. How Can Online Banking Develop its Own Black Card? It’s true, that online banking is immediately associated with the low profile services for the masses. One of the reasons is that when you’re having a traditional ‘marble’ bank, it is easy to segment Clients, separate affluent from the rest, make them feel special (leather couches, greater space, separate entries etc.). But when it comes to the basic online banking, we all are equal. Can a rich person browse faster the online banking service? I do not think so. Online banking was and will be a way to reduce costs of service. Additionally on the early stage marketers chosen this channel to sell services to the price-aware Clients, so onlynie banking become a synonym of cheapness. You have to act carefully, as it is really easy to create an internal competition for your services. Selling premium services there is a challenges, as the Client got used that here he can got things cheaper than at branch, or for free. You may say, we can make him feel special by adding a bunch of additional features, or extend the traditional ones. This may work, but as well it may only confuse him. I’d love to read more on this subject. 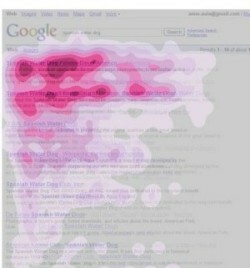 Such perception was created by the websites designs standards/trends. I just wonder if it applies only to the ‘Latin” world, or is it also true in countries like Israel where the right to left scripting method is used. Both of them are showing us that a pen is stronger than a sword, and an identical message can be presented in two opposite meanings easily. I like it’s simplicity, correctly the main focus is laid on the words, and there is no additional distractions. Spot is also showing us, that censorship does not necessary has to mean that we are banning an information. Even greater damage can be inflicted with a slight modification. Kiedy sądzisz, że nic nie jest już w stanie Ciebie zaskoczyć, zdarza się właśnie coś takiego. Bankowość/usługi finansowe to stosunkowo trudny obszar do promocji. Ciężko jest znaleźć nowe sposoby promocji z wykorzystaniem starych narzędzi – w tym przepadku bankomatu. O ile często zdarza się umieszczać informacje promocyjne na ekranie, umocować półkę/wieszak z ulotkami (idealne miejsce do schowania kamery nagrywającej wpisywany PIN… Powinienem zrobić notkę o zabezpieczeniach) to inwencja kończy się zazwyczaj tutaj. Tym bardziej cieszy, kiedy spotka się tak udaną realizację. Na papierowym potwierdzeniu dokonania wypłaty z bankomatu umieszczono wzory orgiami, umożliwiające złożenie myszy dla wersji z bankowością internetową, torebki dla karty kredytowej, świnki dla konta oszczędnościowego itd. Nie doszukiwałbym się jednak wyrafinowanej personalizacji np. drukowanie wydruku z kontem oszczędnościowym dla osoby nim potencjalnie zainteresowanej. To byłoby zbyt piękne. Podejrzewam, że wzory zostały losowo (lub w takiej same sekwencji) nadrukowane na papierową szpulę umieszczoną w bankomacie – na pewno nie był drukowany przez bankomat. Dobrym pomysłem było umieszczenie instrukcji składania na wierzchniej stronie potwierdzenia, w połączeniu z czerwonym kolorem (zgodnym z marką HSBC) powoduje, że trudno jest go nie zauważyć. Zwiększenie prawdopodobieństwa oddziaływania – dodanie informacji o umieszczeniu instrukcji na ekranie, PRZED wybraniem opcji wydruku, np. poprzez słowa ‘mamy dla Ciebie niespodziankę’, ‘nasze zwierzątka czekają na Ciebie’ (ok, co z torebką…) itp. Uniemożliwić przeoczenie tej formy promocji. W zależności od konstrukcji bankomatu, jak i jego otoczenia, rozłożyć kilka poskładanych układanek wokół/na bankomacie. Jak zawsze – współpracować z końcowymi odbiorcami, może jakiś konkurs na stronie internetowej na nowe/lepsze projekty orgiami. Jak najbardziej, chociaż po modyfikacji – pomysł z rozłożeniem poskładanych układanek poza bankomatami w oddziałach banku nie udałby się – pogoda, wandale etc. Niestety nie posiadam dokładniejszych danych (kategoria Oldies –znalezione na dysku) np. co do kraju w którym zrealizowano ten projekt. At the time when you think that there is nothing what can surprise you, it happens… Banking/financial services are a rather hard area to promote. It is difficult to find new ways of a communication with the usage of old tools/vehicles – at this case, a good old ATM/cash machine. We can often see a promotional message placed on the ATM’s screen, or a bunch of paper leaflets on a stand next to it (a great place to hide a miniature camera to record inputted PIN code… I should make a note on the security issues), the creativity usually ends here. That’s why it is even more enjoyable to notice such realization. 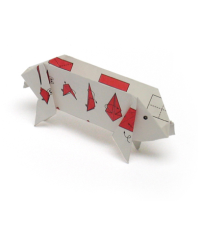 On an ATM’s paper cash withdrawal confirmation/receipt origami patterns were placed, which made possible to create a mouse for internet banking version, a handbag for credit card, a piggy for saving account etc. I wouldn’t search here for some advanced personalized marketing, like putting the saving account version on a possibly interested client receipt. It would have been too beautiful. I’m suspecting, that patterns/instructions were placed randomly (or in the specified sequence) on the ATM’s paper reel – for sure they weren’t printed by the ATM printer. 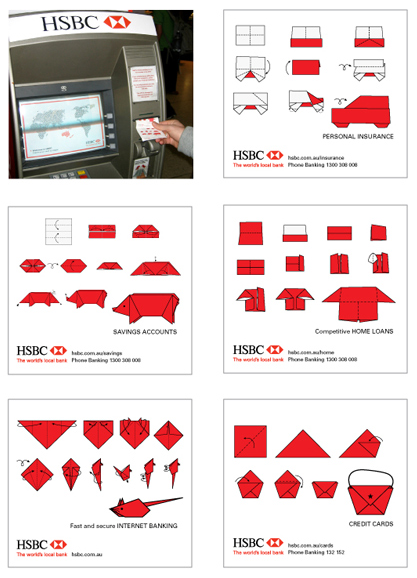 Instructions were located on the top side of the paper confirmation – a very good idea, and in joint with the red color (in accordance with the HSBC brand) makes it hard not to notice it. Usage of the old communication vehicle (an ATM can be called so) in a completely new way. To increase the impact level and spotting probability – add an information about instructions on the screen, BEFORE choosing the ‘print confirmation’ option i.e. with the words ‘we have a surprise for You’, ‘our pets are waiting for You’ (ok, what with the handbag…) etc. This will make missing them impossible. Depending on the ATM construction, or the surrounding environment, place some solved origami puzzles around/on the cash machine, to attract attention. As always – work with your clients, involve them. Maybe a contest on a website for a new/better origami projects? Indeed it can be, but with small modifications, like the idea of placing solved puzzles around the machine will rather not work in the case of ATMs located outside bank branches – weather conditions, vandals etc. Unfortunately I do not have more specific data, like the country where project was realized, as this entry is from the Oldies category. EDIT: Ha, I’ve found the original source in my RSS collection, so credits go to the Guerrilla Marketing defined , and division responsible was HSBC Australia. Get the FT - Global News widget and many other great free widgets at Widgetbox! Wyróżniaj się lub Zgiń !!! Get the Economist.com widget and many other great free widgets at Widgetbox! Copyright © 2009 Habza.pl - Jan Habza. Spolszczenie: Adam Klimowski. 28 zapytań do bazy. Strona wygenerowana w 0.308 sekund.